You don't have to spend a fortune to be comfortable in the office! By following the 6 simple tips, tricks, and pointers highlighted in today's blog post, you'll be operating comfortably and at peak performance levels on a minimal budget. Enjoy! The first step to office comfort and productivity is organization. While most individuals with messy office spaces will hate the organization process, it's a must! Start by clearing the clutter of your desk. Organize your drawers and file cabinets accordingly with a system that works for you. Dedicate one day a week to reorganize your space to ensure you never get overwhelmed and behind. The best part, basic organization is free. Forming good organizational habits will have you working with less stress, and thus more comfortable. Get your workspace organized today. It's free and incredibly beneficial! 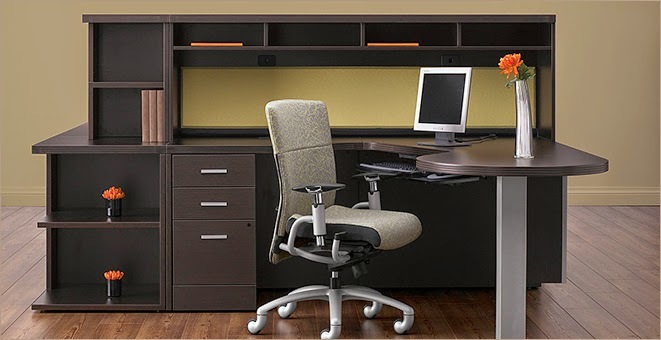 Once your office space is organized, it's time to turn your attention to your office chair. When was the last time you serviced your chair? When was the last time you adjusted it? If you can't remember, today is the day to take back your office comfort. Start by clearing the debris from your chairs casters. There's no doubt a few paper clips wedged in those bad boys! This will improve your mobility around the office. Next, check the tension on your chair's nuts and bolts. If your chair arms, back, or seat are wobbly, you're not achieving your full ergonomic potential. Once your chair has been properly serviced, take the time to properly adjust. Align your chair and work surface properly. Set the angle of your chair back to ensure you're in constant contact with it at all times. Adjust your chair arms, head rest, and other key features to ensure you are posture perfect when computing. Improved comfort should not be far behind! That being said, if you're still dealing with discomfort that's directly related to your office chair, it might be time for an upgrade. This year, best selling ergonomic chairs from leading manufacturers like Global Total Office, Cherryman Industries, and Eurotech Seating can be purchased for less than three hundred bucks. Consider making an investment in your office comfort. Your neck, back, and arms will thank you! Are you using the correct desk layout for your office space? Is the surface of your desk too small to house all the items you need to get through the workday effectively? It's important to ask yourself questions like these to asses the current state of your office comfort. You can't work efficiently with limited space. This is sure to cause frustrations and consequently, a drop in comfort! In 2015, U shaped desk configurations have been the most popular option. These layouts provide plenty of work surface space and great ways to organize. In addition, you may consider upgrading to a standing desk. These trending ergonomic furniture solutions promote continuous movement in the workplace, improve blood flow, and reduce fatigue. While an ergonomic desk may be a bit much for the budget shoppers, the growing popularity of these products is rapidly bringing the price point down. If you can't afford a whole new desk configuration there's no need to worry! Contact your furniture provider to see if there are add-on products available for your furniture collections. 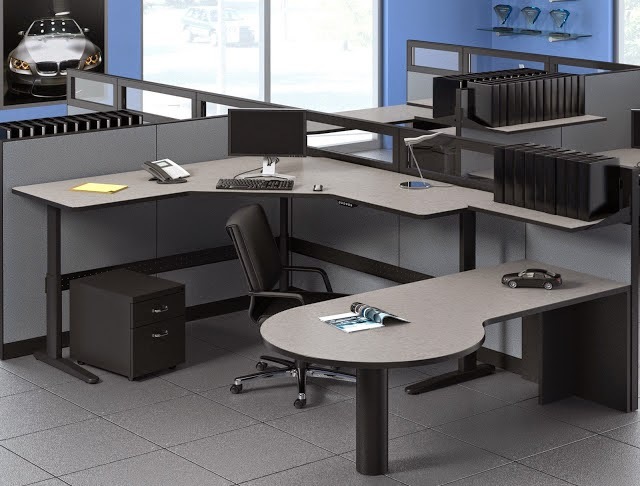 Commonly, desk returns and bridges can be connected to provide you with more operating space. While a single and or dual screen monitor arm will require a small investment on your end, it's definitely worth it! 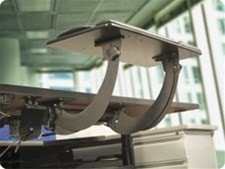 A monitor arm will instantly increase the amount of usable desk space that's available in your office. No more leaving your monitor on the factory base. These provide limited adjustment capabilities and lack in terms of quality ergonomic benefits. A dual screen monitor arm will allow you to compute and browse the web far more efficiently. These helpful ergonomic tools are a must for any worker looking to streamline productivity while improving comfort. 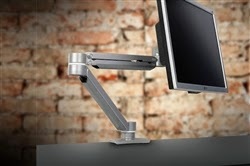 We recommend checking out the ergonomic monitor arms available from brands like Mayline, Symmetry Office, and ESI. The odds are, you have a retractable keyboard tray in your office. It's also a safe bet that if you're keyboard tray is adjustable, it hasn't been adjusted in quite some time. As we are creatures of habits, we tend to find ourselves settling for the current state of our office interiors. That being said, if you're on a quest for comfort, this is one habit that has too change. Take the trip underneath your work surface to check out the housing mechanism of your keyboard tray. If you see levers and knobs, that's a good thing! Tweak the angle and height at which your keyboard tray sits. We've included a diagram above with some pointers. 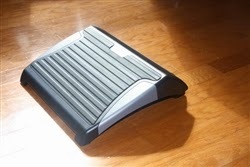 You can purchase an ergonomic foot rest for less than a hundred bucks. However, if you're on a limited budget, you can make one! A stack of books, magazines, or boxes will do the trick. Foot rests help to take pressure off your knees and improve blood flow. An adjustable ergonomic foot rest is preferred of course, but no matter what, find some way to kick those feet up when working. You'll be glad you did!